Alan Parsons at Studio at The Palms. Over his long and illustrious career Alan has engineered, produced and/or composed some of the most recognizable music themes of our time: Sirius–used by the Chicago Bulls and which provided the audio backdrop to 2012’s Soccer’s Euro Cup, John Miles’ Music, a staple ‘energy builder,’ heard in almost Olympic competition somewhere to add drama, and of course the classic “Money” from Pink Floyd. Alan had never before spoken about the creative processes behind these signature recordings, what it takes to make a piece of music compelling, recognizable and appealing across international borders, eras and events. The “Iconic Instrumentals” workshop offered the unique opportunity to work alongside Alan Parsons on the creation of a brand new instrumental theme. Who knows, perhaps a classic of tomorrow? Alan initially looked at composition and arrangement before moving onto the tracking session for the new theme. 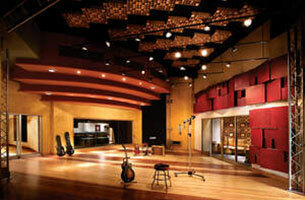 Instrumental overdubs followed, with a special focus on how to create sounds that grab the attention. The mixing portion of the workshop was especially interesting, with a special segment on 5.1 Surround mixing. Alan Parsons has long been a champion of mixing beyond stereo and he was nominated for a Grammy for Best Surround Recording in 2007 for his album A Valid Path. 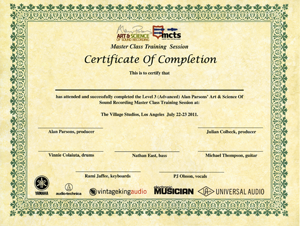 Master Class Training Sessions (MCTS) are special and unique occasions for audio professionals, aficionados and students alike, giving them the opportunity to participate in a very practical way with one of the best in the industry. Attendees are always encouraged to ask questions and make suggestions throughout the workshop. Reactions to the MCTS event in Los Angeles can be seen in a short video at the end of this page. 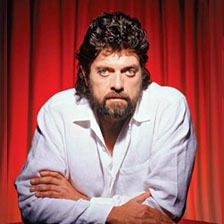 In 2010, Alan Parsons felt the need to share his extensive knowledge and expertise with the rest of the music industry. With the help of fellow Brit Julian Colbeck, Alan wrote and produced a comprehensive instructional video series about recording called Art & Science Of Sound Recording (ASSR). It features contributions from a myriad of celebrity artists, engineers and producers and is narrated by Billy Bob Thornton. It is available as a 3-DVD set and as downloads. All Our Yesterdays, a song written especially for the series, features some of LA's finest musicians and a rare performance by Alan on lead vocals. Alan has been supporting ASSR with a series of lectures and Master Class Training Sessions (MCTS) all over the world. It has been a great opportunity for the attendees to witness Alan at work in the studio and to participate actively in the making of a possible future hit. Craig Martini (Bass) is currently touring with one of today’s most influential guitar shredders, Paul Gilbert. In addition to the mind-melting rock he plays with Paul’s band, Craig also performs extensively with ‘variety’ or ‘show’ bands in Las Vegas Nevada, where he lives. Craig also played with Pitch Black Forecast, the Szuters (on the album “The Szuters” produced by Paul Gilbert) and Jani Lane’s Warrant. Jimmy Crespo (Guitar) is originally from the East Coast and has recorded and/or performed with Rod Stewart, Stevie Ray Vaughn, Jeff Beck, Jon Bon Jovi, Billy Squire, Julian Lennon, Sebastian Bach, and many more. Jimmy is perhaps most recognized as a member and co-writer of Aerosmith from 1979–1984, co-writing Rock In A Hard Place with Steven Tyler and performing all guitar duties on the album. Crespo toured with Rod Stewart on some of his most successful world tours. Pat Caddick has been involved in the LA and Las Vegas music scene for more than 25 years as a player, arranger, orchestrator, producer, and director, working with artists such as Barbra Streisand, Melissa Etheridge, Kevin Costner, Maurice White and Philip Bailey, Celine Dion and many more. Pat has scored films (Universal, Colombia Pictures, Golan Globus) as well as composing theme songs for TV (NBC, CBS). 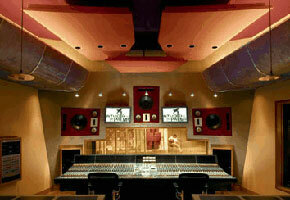 His recording studio in Las Vegas was recently sold to the multi-platinum selling group, “ The Killers”. He is currently Musical Director of Vegas! The Show at Planet Hollywood for which they were voted Best Band in the Broadway Polls. He is currently writing for the new Tower of Power album, to be released in 2013. Platinum Attendees will be in the control room with Alan during the entire recording process, will receive a copy of the 3 DVD set of ASSR, ProTools stems and will also receive a signed Certificate of Completion personally presented by Alan Parsons at the end of the workshop. AES Members qualify for a 10% discount on Platinum seats only. A new feature for 2013 is the ‘post-event’ opportunity for (Platinum Attendees only) to mix their own version of the recording using the supplied ProTools stems. Alan Parsons will critique and provide notes on your mix. Sign ups for this feature will be made at the event itself for an additional fee of $250. Gold Video Village seats: $345 per day or $495 for both days (Limited to 30 per day). Gold Attendees will be in a ‘video village’ set up in a separate room at the studio with a closed circuit live feed from the studio and tracking room. You will also have access to the live tracking room during set-ups and will have access to Alan during breaks and lunch for questions and receive a stereo mix of the recording. Please contact the producers Keyfax NewMedia for further information. Platinum Attendees will each receive a signed Certificate Of Completion personally presented by Alan Parsons at the end of the workshop. Accommodations from January 31 through February 3 can be arranged by calling the Palms at (702) 942-7777. The preferred pricing rates are: $79/$119/$139 for those nights, plus a $20 per day Resort Fee. Ask for reservations, and then say you are booking under the group name "Art and Science." You must book before January 28th in order to qualify for our special room rates. For other details, contact us at info@artandscienceofsound.com. 10.00–11.30 "Iconic Instrumentals Revealed" - A talk & audio lecture. Alan Parsons discusses composition and arrangement and reveals how some of his most famous instrumental recordings were created. 11.45–1.00 Preparing the tracking session for the new theme with drums, bass, guitar, keyboards. 1.00–2.00 Lunch with Alan at Bistro Buffet. 2.00–4.15 Continue tracking session with keyboard overdubs. 4.30–6.30 Keyboard and guitar overdubs. 09.00–10.00 "Iconic Workstations". The Yamaha Motif XS/XF is presented by Motif guru Dave Polich and Julian Colbeck from Keyfax NewMeida. Coffee and pastries will be served. 10.30–11.30 A playback of some of Alan's own quad mixes from Dark Side Of The Moon & Final overdubs (as necessary). 1.00–2.15 Lunch with Alan at Bistro Buffet. 6.00–6.30 Wrap and final playback in stereo and 5.1 surround.